Digital pianos have a lot to offer and musicians are finding that they are increasingly handy instruments. Almost every genre of music can incorporate them and any kind of pianist can find a digital piano that suits them. This is because the best digital pianos are versatile and can cater to a variety of needs. Acoustic pianos tend to come in two general conditions. They are either in great shape and extremely expensive, or they are cheap but incredibly overused. Digital pianos offer pianists the opportunity to own a good instrument without paying the extreme price, and while some of the best digital pianos out there can still be rather expensive, they come with bonus features and unique capabilities that regular acoustic pianos do not have. There are plenty of digital pianos available and if you’re looking to buy one or you’d like to learn more about them then you’ve come to the right place. We’ve put together a purchasing guide for the right digital pianos. We’ll go over all the general knowledge that you need to know about these type of instruments while also highlighting the top ten digital pianos in the market right now. 4 Which One Should You Pick? Digital piano sales are climbing for a reason. These instruments come with many benefits and can very well prove to be worth your time and money. But it is important to note that digital pianos come with downsides too. Because the competition is so diverse, certain benefits and drawbacks may apply to some digital pianos while not correlating with others, but for the sake of giving buyers a basic idea of what to expect from a digital piano, we’ve generalized both lists. Versatile – Digital pianos often come with a slew of built-in tones and sound effects that can be utilized for a variety of purposes and genres. 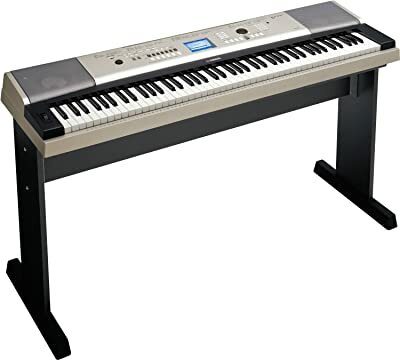 Portable – Most digital pianos are lighter and much easier to move than acoustic uprights and grands. More affordable – You will hardly ever find a good acoustic piano for around $1000 or less, but there are plenty of high quality digital pianos that fall within that budget. No need to tune – Digital pianos will never go out of tune, and many of them will even allow you to tune the piano sharp or flat a few cents or by whole and half steps entirely so that you can match the tuning of the musicians around you if they have difficulty tuning to you. Mobile – We’ve already mentioned that digital pianos are often quite portable, but keep in mind that their mobility also means that you can take a digital piano out to a gig or a performance, and maybe even set it up outside (just make sure you have batteries and you keep an eye on the weather report). Output jacks – You can use the speakers on your digital piano, or you can plug in and hear your music through a set of headphones or an amplifier. This offers you a variety of ways to deliver your music to an audience or your own ears. Sound quality – Ask a professional pianist about their preference. They will probably tell you that they prefer the sound of an authentic piano over the canned sound of a digital piano. Keep in mind that the technology gets better every year and digital pianos are sounding more and more authentic, but nothing sounds quite as wholesome as a real grand piano in a concert hall. The feeling – It doesn’t take a professional to notice the difference between how the keys feel on an acoustic piano vs. a digital one. 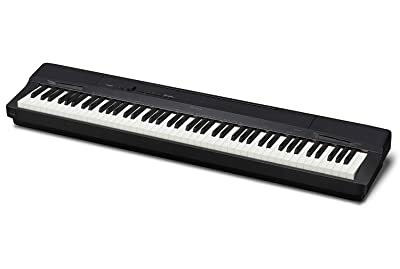 Weighted keys and other features have been added to many digital pianos in order to replicate the feeling and mechanics of traditional keys. Yet, it just doesn’t quite feel the same. Dependence on electricity – While this is a bit obvious it’s worth noting that in order for your digital piano to work you must have access to electricity or battery power. This may limit where and when you can play your piano. As you can see, the good mostly outweighs the bad here, but the drawbacks are worth keeping an eye on when you shop. Digital pianos come with a handful of other advantages and drawbacks which you can check out here. Buying a musical instrument is a lot like buying a car. The best and most trustworthy way to know that you are getting your money’s worth is to test out the product. If your local music store carries the digital piano that you’re considering buying, it wouldn’t hurt to go in and play the instrument first. Most music stores will gladly help you set up any instrument so you can test it out. They may even offer you a better deal if they know that you’ve been looking at the instrument online (again, a bit like a car dealership). Check out reviews and ask around. Previous users will have more insight on the instrument than anyone else and they will also be sure to give you their opinion on whether the instrument is worth the price. Most online websites and music stores will sell identical items for the same price, but every now and again someone offers you a good deal. If you’re decision is greatly affected by your budget then this may open up your options a bit. Think about why you need or want a digital piano. It’s important to consider what features you need. If you really want a piano that will plug into your computer than look for one with MIDI software. Or maybe you want to have some cool synth voices; try a piano that offers a wide variety of tone options. If you’re just looking for a portable practice piano then try something a little less elaborate and expensive – there’s no need to get a digital piano with a bunch of special effects if you don’t plan to use them. How about we narrow your search down a little bit? Below are some of the top digital pianos available right now. They are not listed in any particular order as they all have their own advantages. This piano boasts 88 weighted keys that feature “graded hammer” effect to mimic the feeling of playing an acoustic piano. The 128 note polyphony of this instrument allows you to play multiple notes without cutting off previous notes as they sustain. On top of this the piano includes built in una corda, sostento and sustain pedals. The goal of the Yamaha Arius YDP-181 is to resemble an acoustic piano as much as possible while having the benefits of a digital piano such as perfect tuning and little need for maintenance. The P35 is essentially the less expensive version of the Arius YDP-181. It sacrifices several features like built in pedals and divides the polyphony by 4. The 32 note polyphony however is partially a result of the P35’s ability to not only voice several instrument tones at the same time but to split them between the left and right hand. The piano offers a modest 10 preset voices however the voices are rich and you can adjust reverb quality between 4 different settings. This instrument is similar to the P35 except the Casio CAS PX150 offers a wider array of voices. As a result there is a bit of a climb in price. This instrument is great for those looking for a lot of options in terms of voicing. The YPG-535 has 500 voices built in. This leaves a ton of room for creativity and special effects to make your songs unique. 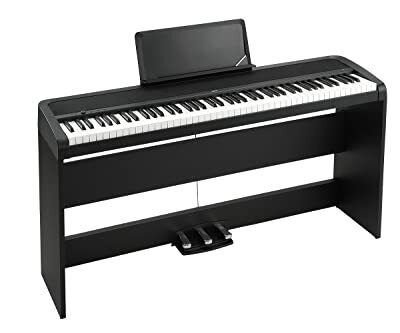 With such a wide array in options, you can use this piano in a variety of outfits ranging from Jazz bands (with great saxophone and trumpet voices at your disposal) to Techno groups (taking the electric synthesizer voices into account). 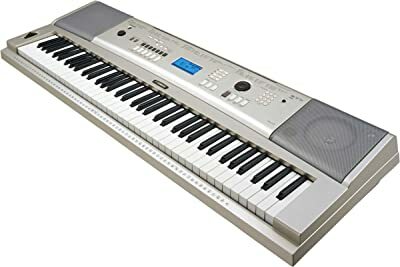 The keys are unfortunately not weighted and performers will know they are playing a digital piano but the YPG-535 does include touch sensitivity options. This is the standard in many keyboard labs in colleges right now. It’s very affordable but highly useful. A few less voices than the 535 but just was varying in capabilities, the YPG-235 is a great option for those who like the 535 model but can’t quite afford it. Note that the YPG-235 is slightly smaller and has only 76 keys vs. the 88 of the YPG-535. It’s rare that a digital piano doesn’t come with MIDI nowadays but those interested in the Korg B1SP probably don’t require MIDI features. 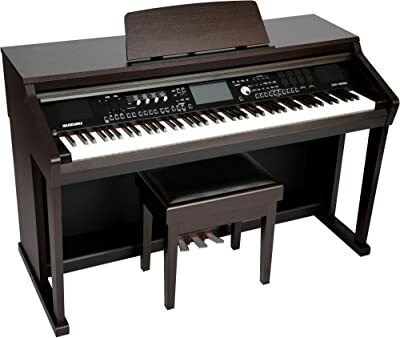 The Korg B1SP is a sleek and modestly sized piano that sounds fairly authentic and plays with a similar feel to the likes of an acoustic piano. 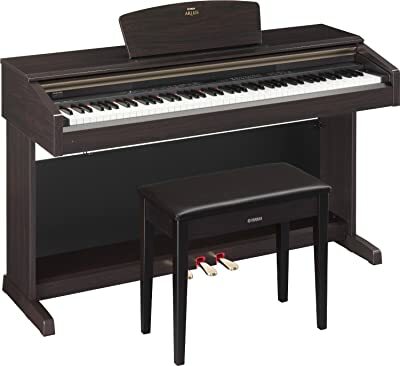 These features along with its three essential foot pedals, attached music stand, and fair price make it ideal as teaching pianos. Fully weighted keys, nearly 700 voices, and 128 note polyphony make this piano the best of both worlds. It combines the real feel of an acoustic piano with the high tech features of true digital piano. The one drawback of this instrument (aside from the price which is fair for how wonderful the instrument is) may be its lack of portability. Instruments like the YPG-535 can be packed up and stored in a case in just a few moments but the Suzuki SDP-2000ts is the type of piano you’d probably keep in one place. It is bulky and beautiful, and it just might be as great a furniture piece as an instrument. This is an instrument ideal for youngsters. 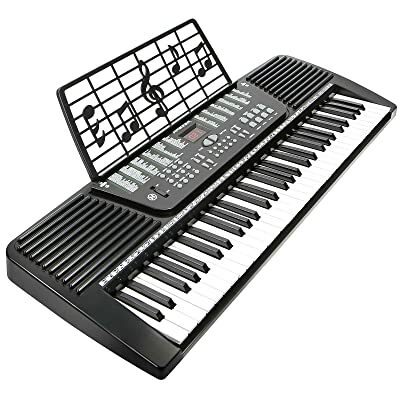 The sister version of this keyboard comes with MIDI features while both offer a variety of features that will get pique the interests of young digital piano users and get them on the right track. Williams is known for their efforts to make decent keyboards at a competitive price. This is no spectacular instrument but it gets the job done for those on a tight budget who still want a few unique options. This is the instrument that you will see many modern rock and pop band using. It is not just a digital piano but an incredible MIDI controller and synthesizer. They all look great, don’t they? But which one is right for you? Ask yourself these questions and you’ll have a lot easier of a time deciding. Is This Piano for a Beginner? Beginners won’t need expensive instruments or an overwhelming amount of features. The Hamzer 61 Key EMK or Williams Legato are probably the way to go. Meanwhile the Korg B1SP is an instrument that is a bit more expensive but teachers will enjoy its qualities enough to find the price fair. It may not be suited for a beginner to own, but it’s not a bad instrument for instructors who see multiple students in one week. If you are not buying a piano for a beginner then don’t risk too low of a price, but keep in mind that some of the middle ranged priced instruments are still top notch. 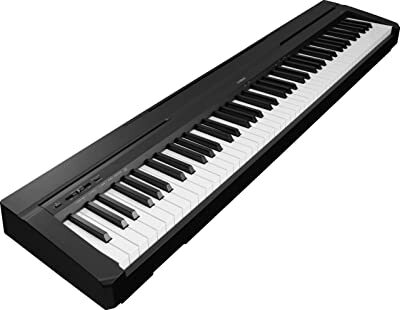 Professional pianist and keyboardist will prefer instruments such as the Suzuki SDP 2000ts (with a touch screen that makes it good for teaching as well) and the Nord Stage 3 which is ideal for both live concerts and studio performances. But the pianos for experts are priced for experts. For those who can’t live without weighted keys – you’ll likely want to try the Yamaha Arius, the Suzuki SDP, or perhaps the Yamaha P35 which is much less expensive than the other two. The Casio CAS PS150 is a great inexpensive choice as well. If you need a wide variety of voices/tones then you’ll likely want something like the Yamaha YPG-535 or 235. It seems that no matter what your needs are there is a digital piano out there for you. Don’t be intimidated by the expanding technology of digital instruments, if you can embrace breakthroughs and developments of electronic instruments and their influence on music, you just might be able to do things musically that you never imagined before. Digital pianos may not always stack up to the sights and sounds of the finest acoustic pianos, but they truly are useful, effective and downright enjoyable instruments. It’s worth giving one a try.